The race for the presidency of the 9th Senate gathered momentum at the weekend with the main contender and Senate Leader, Senator Ahmed Lawan, intensifying his one on one campaign and meeting with senators-elect, those of the opposition Peoples Democratic Party (PDP) stock in their home states. Sources close to the camps of former governor of Gombe State, Senator Danjuma Goje, and former Senate Leader, Senator Ali Ndume, however, told the media that in spite of the tough talk of the ruling All Progressives Congress (APC), they would not give up their ambition to become the next Senate president. Specifically, the Ndume camp said no intimidation from any quarter can force the three-time Borno South senator to abandon his ambition that had received the blessings of APC leaders in his senatorial district and the two other senatorial districts in Borno. It was also learnt that Ndume had since stepped up his consultations with all necessary stakeholders, including senators-elect across party lines and members of APC National Working Committee (NWC) on the need for them to support him. The pro-Ndume group also expressed concern that the adoption of a particular candidate for Senate president does not have the blessing of all NWC members and President Muhammadu Buhari. According to a ranking APC senator who spoke on condition of anonymity, “I can say authoritatively that the reported adoption of a particular candidate is the agenda of APC National Chairman, Mr. Adams Oshiomhole, and National Leader, Senator Bola Tinubu, while the president and some members of the NWC are not on the same page with the duo on this matter. Lawan, on his part, intensified his consultative meetings across the states at the weekend with visits to Kano, Niger and Borno States where he met one on one with some senators-elect. He met individually with the senators-elect from Kano and Niger states who openly pledged their support for his candidacy for the Senate presidency. Lawan confirmed to THISDAY in Abuja yesterday that he had commenced consultative meeting with senators-elect over his ambition. He also allayed the fears that he will be an appendage of the executive if he emerges as Senate president, saying nothing can be far from the truth. 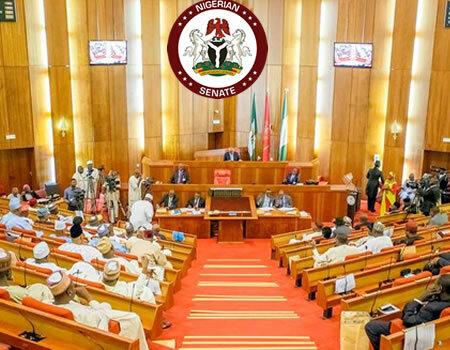 According to him, his consultative meeting with other senators-elect in other states will resume today at the second batch of the orientation programme being organised by National Assembly management for federal legislators-elect which ends on Friday.